I began trimming in 2003 after years of being fascinated by farrier science. I was certified as a “Martha Olivo United Horsemanship Mentor Hoof Groom” in August 2004. After an extended phone conversation with Pete Ramey in September, 2004, I began applying his techniques and was impressed with the immediate changes I saw in horses that had been barefoot for up to two years, including my own. Pete's trim techniques resulted in horses going barefoot comfortably on many surfaces after a very short period of time, without a notable transition period. See Pete Ramey's site http://www.hoofrehab.com/ for more information on his hoof care approach. My most valuable trimming trainers and coaches have been the horses I’ve trimmed. I owe much to Pete Ramey, who shares his invaluable knowledge and resources so that we all understand what to trim and what to not trim. I spent 27 years San Jose, California, in High Tech Marketing, Sales, Engineering and Business Development. I lost my "bleeding edge high tech marketing" position in 2001, spent a year unemployed, and decided to follow my dream and move to the country to pursue a career working with horses. I bought a newly opened tack store in Mendocino County from a friend, spent 3 years developing it, only to realize that the bulk of my time was spent doing bookkeeping, which I hated. I decided to sell the business in March 2005, and moved to Sonoma County, and soon began trimming full time. I launched my www.HealthyHoof.Com web site in April of 2005 as a way of documenting the transition processes I witnessed in horses who reportedly “couldn’t go barefoot”. I'm passionate about soundness, about rehabilitating horses, mules and donkeys with chronic soundness problems. I'm equally devoted to supporting barefoot horses of owners with performance goals, because these people prove to the world how robustly sound barefoot horses are. 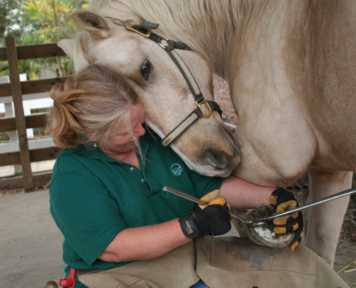 I offer training and advice to hoof care professionals’ and amateur trimmers who share my devotion to improving horses’ lives by restoring their soundness naturally.